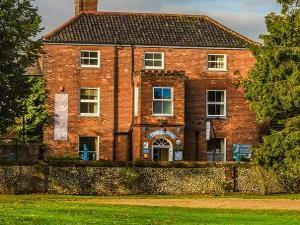 The Lawns01263 713390work HotelThe Lawns Wine Bar & Hotel has 8 comfortable en-suite bedrooms all with tea/coffee making facilities, flat screen TVs with DVD players and locally made toiletries, close to the north Norfolk coast. The Lawns Wine Bar & Hotel has 8 comfortable en-suite bedrooms all with tea/coffee making facilities, flat screen TVs with DVD players and locally made toiletries, close to the north Norfolk coast. Awarded 4 stars by the AA and a rosette for culinary excellence the menu make use of local seasonal food as much as possible. Open all day from 11am. Food is served from 12pm-2pm and 6pm-9pm. Check-in from 2pm. South-facing garden with terrace. Boule/Petanque pitch in garden. Cycle storage available. Children welcome from any age. Travelling towards Cromer on A148 take left turn (marked Town Centre) into Station Road. Travelling from Fakenham turn left at obelisk and drive through Holt taking the right hand fork at War Memorial. We are having 3 ground floor rooms added next year, for easy access for wheelchair users.